Today marks the first in what will hopefully become a regular fixture on this blog – Flash Fiction Friday. Last Friday, Lisa Walker England declared her intention to post a piece of flash fiction on her blog each Friday, because it seems odd for fiction writers not to put fiction on their blogs. That made a lot of sense to me, and I’ve decided to join in. So here, hastily written but hopefully still entertaining, is my first Flash Friday piece. Enjoy! The factory rushed up and down the Lancashire hillsides, a vast mass of red bricks and frantically clattering looms, its wheels gouging up fields, ripping chunks from roads, smashing aside drystone walls. Dirk Dynamo clung to the roof like a trooper to his gun as the building continued in its unstoppable course, straight ahead, no distraction or diversion. 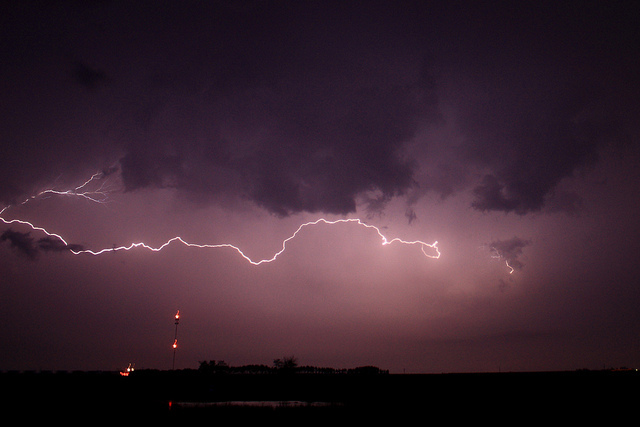 Timothy Blaze-Simms had braced himself against the base of the lightning conductor. With one hand he held his top hat in place, while the other hand held up a rod covered in glass tubes, strange dials and long curling wires. ‘But adding the lightning generator?’ Dirk jerked an angry finger upwards. Above the copper globes and sparking wires with which much of the factory was topped, black clouds filled the otherwise clear sky. Every couple of seconds a lightning bolt burst out of the roiling mass, usually hitting the conductor but occasionally lashing the rooftop around them. ‘How else would I know how they worked together?’ Blaze-Simms said. He pointed past the conductor and down the latest hill. The outer slums of Manchester sprawled before them, a teeming mass of humanity about to be hit with a crushing weight of bricks. A flicker of electricity leapt off the conductor and hit the device in Blaze-Simms’s hand. The glass tubes exploded. The dials smoked. The wires burst into flames. He flung the whole thing aside as it started to melt his thick rubber glove. ‘Guess we’ll do this the old-fashioned way.’ Dirk scrambled across the rooftop to where long cables ran from the lightning conductor down into the factory and its engines. He pulled the bowie knife from his boot and glanced up at the clouds. Metal knife, metal wires, lightning. This could go very wrong. He watched the pattern of the lightning strikes, waited for a lull and heaved with his knife at the thick cable. Muscles bulged so hard the seams popped in his shirt. Lightning lashed down again. Just as it hit the tower the cable split and Dirk went flying backwards. ‘Yes!’ he yelled in triumph. ‘No!’ he shouted in frustration as the lightning jumped the gap between cables. ‘We could try earthing it.’ Blaze-Simms’s tailcoat flapped behind him as he stared shamefaced towards the fast approaching city. A drainpipe ran from the roof down past the balcony. Dirk swung himself over the edge and clambered down the cold metal of the pipe. He’d barely gone six feet down when a flash of lightning struck the top of the drainpipe. Sudden juddering pain ran through his whole body and he was flung from the pipe, hurtling into the empty air. He shot out his hand, just managed to grab the balcony as he flew past. He gripped as tight as he could with fingers jolted by lightning and the impact of the steel rail. Thirty feet below, sharply tracked wheels tore the grassy green skin from the countryside. Dirk swung his other arm up, desperately trying to get a grip as lightning lashed down, now joined by rain. He stuck the end of the cable into the steel opening of the drainpipe. A flash lit him up like the New York skyline and he tumbled back onto the rooftop. Along the wall from Dirk, the drainpipe hummed with power. The factory’s wheels were coated in a bright blaze of electricity as the lightning ran down the pipe, across the wheel-rims and down into the ground. Robbed of power the wheels slowed and ground to a halt. Inside the factory looms clattered to a standstill. Lightning still lashed around their heads, but it now ran safely away into the ground. Bewildered Mancunians emerged from their houses to stare at the new building in their midst. Dirk heaved himself up onto the balcony and climbed up the building as fast as his aching body would allow, avoiding metal along the way. Reaching the rooftop he rushed over to Blaze-Simms’s smoking body. ‘Tim? Tim, you alive?’ He grabbed the Englishman by his lapels and shook him hard. ‘No more moving factories,’ he mumbled. ‘No more factories,’ Dirk agreed, grinning with relief. ‘Maybe a museum,’ Blaze-Simms said. If you enjoyed this then you can read other adventures from Dirk Dynamo and Timothy Blaze-Simms, of the ever-adventurous Epiphany Club, in my collection Riding the Mainspring, available as an e-book through Amazon and Smashwords. Picture by Dustin Ginetz via Flickr creative commons. Posted on 26th September 2014 Author andrewknightonCategories storyTags Epiphany Club, fiction, flash fiction Friday, short story, steampunk, why wouldn't you combine a lightning generator and a lightning powered factory? Cool. I’ve just been reading some of the other stories people posted, which made a great start to my week. And expect more from me this Friday, though I’m not sure what yet. I think you’re right – well done for getting the ball rolling. Thanks Sue. I can’t even remember where the name Blaze-Simms came from, beyond wanting something that sounded somewhat upperclass English and somewhat action-packed. I have some longer stories with these guys in the works too, so there’s more to come. Great fun. Thank you for posting it. Thanks Sheila – glad you liked it. The first of many Flash Fiction Fridays by Andrew Knighton, and it does not disappoint! I have just started reading Knighton’s Riding the Mainspring, and it is my first steps into the steampunk genre. So far, the journey has been amazing and enlightening. I am looking forward to finishing the book and have hopes that he may do a steampunk-horror mashup someday *wink wink*. Wonderfully imaginative and humorous. I really enjoyed this! Thanks Noelle – glad you enjoyed it. I have a lot of fun writing these characters. It shows! I was smiling as I read! This is so much fun! I love the characters’ interactions and the little tiny reminder of Howl’s Moving Castle, couple with a crazy inventor and such a doubtful helper. Really awesome! I have to admit that I haven’t read or seen Howl’s Moving Castle, though I hear that it’s great. For me, moving buildings are always a reminder of Philip Reeve’s fabulous Mortal Engines novels, and of 19th century Chicago, where they really did move buildings around for reasons that I’ve now forgotten.